After years of Wyoming being dead last in the Mountain West Conference in terms athletic budgets, Colorado St. has finally found a way to spend less than UW. Just barely. "CSU ranks last in the Mountain West Conference in the 2005-06 school year when it comes to athletic spending. The Rams' budget of $18 million trails each of the MWC's other eight schools, in some instances by millions of dollars." "The Rams, who had been near the bottom since the MWC began and that way in its former Western Athletic Conference days, fell to the bottom spot this year. 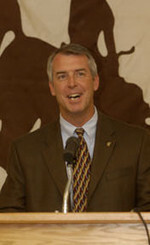 Wyoming athletic director Gary Barta recently told the Wyoming Tribune-Eagle that the Cowboys surpassed their border rivals with an $18.5 million-$19 million budget this school year. 'We used to have the very smallest budget in the Mountain West Conference. First it was eight out of eight, and when TCU joined (in 2005) it was nine out of nine,' he said. 'We've closed that gap dramatically to the point where we surpassed CSU.'" A journey of a million miles begins with one step...or some crap like that.